Be sure to check out the calendar on the left side regularly for new events, sometimes including some by other car clubs or communities that you might find interesting! NOTE that full details of each event are available just by double clicking on the summary text, or by going to the Upcoming Events Tab above. 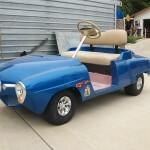 See below or the Ads Page for 11 cars and 1 truck For Sale, including 2 Avantis plus a Stude Golf Cart, some parts collections and Vehicle Storage Space for rent! Also, check out the “Links” tab for other chapters, parts suppliers, etc. Our chapter booth at the BIG 3 SWAP MEET in February went well, provided good exposure for our club and Studebakers. We are planning a spring outing, and Keith Wahl has suggested a trip to Borrego. The group decided to do that on Saturday, May 11th in lieu of our regular meeting that day. We will meet at Dudleys (at the intersection of routes 78 and 79 in the hamlet of Santa Ysabel, east of Ramona) at 10 AM on that day. Regarding plans for the Cool Classic Car Show for this year, Keith Wahl and Ken Meredith are working on that. Tentative date is August 17th. 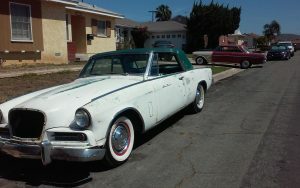 A friend of Bob Buchaklian, Gladys Evin, is selling her nice ’62 Hawk. Keith Wahl invites you to camp or cruise in old-school style with updated comfort. 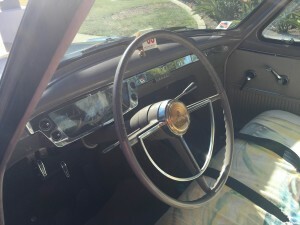 Studebaker, the only wagon company to convert to cars and be successful, celebrated 100 years in business with the 1954 and 1955 Conestoga 2 door wagon. 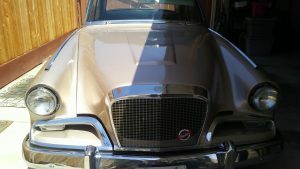 This Extremely rare model made only 2 years was bought new in Tucson, AZ and still has dealer plaque on tailgate. This is an Original Arizona Car. 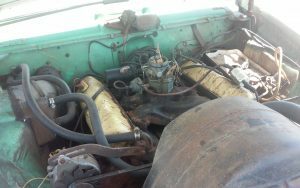 At some point it was sold, had an engine and transmission build with the Chevrolet 350 Engine in Arizona. It was sold to a serviceman from Indiana. There is an Air Force Base sticker in the window from Tucson dated 2004. This is a rust free vehicle. He put the car up for sale On Ebay in 2011. Photos I requested in November 2017 from owner # 3. The car is in Rancho San Diego. Owner is Sandy Robins, 619-670-6634. Keith Wahl has vacant garages for rent at an apartment complex on 49th Street off El Cajon Blvd in the Talmadge area of San Diego (near San Diego State). It is 9 X 16 feet and has private alley access. A one-year lease is offered at $195 per month. No shop or business. 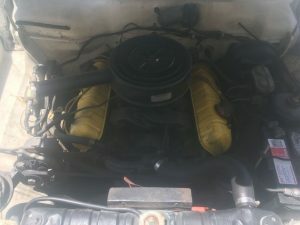 Looking for a 6 cyl 245 engine for a ’50 Land Cruiser or Commander. If you have one or know of one please call Steve at 909-973-6955. 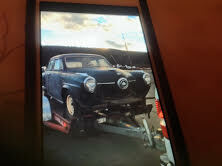 I have a 1957 4 door that we harvested the body and frame.. i am looking to get rid of the complete drivetrain, seats, champion flat head, with extra head, trans, seat trim, steering collumn, heater, axle, pretty much everthing besides the body and frame…we are not looking for a ton of money more to have these parts go to a good use..could make a good deal for everything.. parts are in Escondido. Call Mike (760) 613 6737, or email dtrader45@gmail.com. Hello, my name is Ron Flenner. I am a member of the SDC from Eureka, Ca. 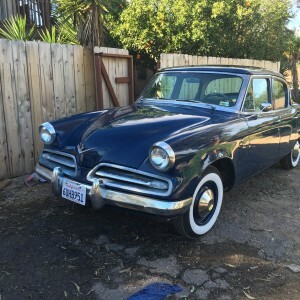 I purchased a 1956 Studebaker 2-Door Parkview wagon last 11/2015 it had 73,000 original miles and is in very good condition. 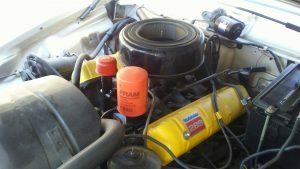 Since the purchase I have had the gas tank, fuel lines, and fuel pump repaired. In addition, I have had a new rebuilt starter, water pump, 4-barrel carb plug wires and a total tune up done to the car. The brakes have been inspected and a new master cylinder added along with a new dual muffler system for safety purposes. The tires and other running gear are fine. 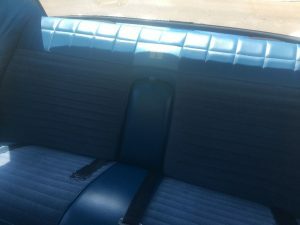 The car does need a new interior, seats and headliner or a set of good quality seat covers. 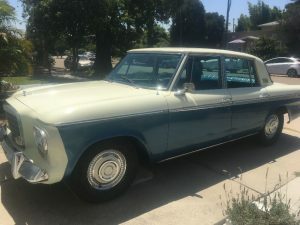 In all honesty, there are some rust issues, but, the vehicle was garaged in Tracy, CA in the past and is really in good shape. I am interested in selling the Parkview for $ 12,500 or OBO. 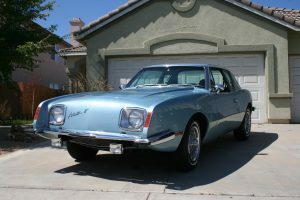 In addition, I may consider a trade for another Studebaker of similar value. (The vehicle has the 259 ci-v-8-3 speed column shift-4-barrel-and dual exhausts) I can be contacted by cell-707-362-1916 or by e/mail: rflenner@pacificviewcharter.com. Please see ad in classified section (“ADS” tab) for pictures. 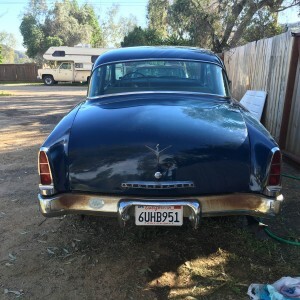 Here is an all original, unrestored car in very good shape, it has a solid and straight body no rust good original paint, this car is very rare – very hard to find one that has not been altered or changed this car is 100 % original. Less than 5,400 produced. Will need to have the chrome redone, everything is there, vehicle is complete, has a six cylinder flathead with three speed with overdrive. New parts include new battery and rebuilt starter, also vehicle has current registration and clean title. Has not been sitting in a field getting destroyed by weather and mice. 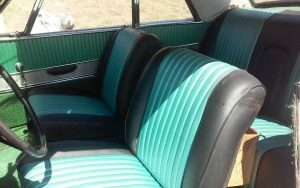 Vehicle is very nice good interior, car runs good considering it is 63 years old. In conclusion the car is all original and complete you would be hard pressed to find another one in this shape for the price that is original and un molested like this one. Add the overall condition of this car that you do not see for sale very often and its uniqueness. Price is $5000. There are more pictures available, thanks. Joseph Russo, jdrusso58@gmail.com Car is in the El Cajon area. The Halgrens, the St. Clairs, Keith Wahl and Ken Keller represented our chapter at the International Meet for 2018 in Tacoma. Here is a wide view of all the great cars. Please see below (under the summary of the recent Zone Meet) for a great article by Keith Wahl about his adventures going to and returning from the International Meet! 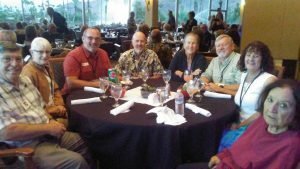 Here is a shot of some of the San Diego Chapter folks at the Zone Meet dinner. Also at the Zone Meet – Ken & Stacy Meredith’s ’57 President and Bob & Mimi Halgren’s ’53 Starlight Coupe. As many of our club members know, my original 55 Wagon was totaled last October 7th 2017 – thought to be damaged beyond repair. I found an identical replacement wagon, later-in-the-year model with curved windshield. When I realized that my damaged wagon could be salvaged I had already started work on this Arizona rust-free car which made its way to Tennessee where it was shipped to me. Unfortunately that resulted in damage to the roof. However, it was a really good car. So I ended up restoring both cars. 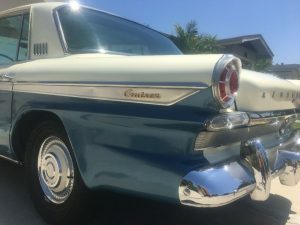 As a treat to myself and with the desire to sell my more recent ’55 Conestoga, plus give it a real shake-down cruise, I wanted to go to the SDC International Meet to show it off, sell it, and come home on a plane. Unfortunately that did not happen. Ken Michael (long term San Diego SDC member, friend and neighbor of the Halgrens in Payson Arizona) and I made plans to drive up and caravan. 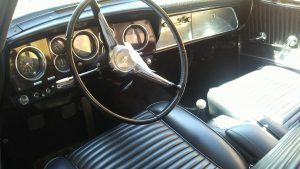 He was going to drive his 62 GT Hawk but it was never road tested and he could not get the interior finished in time. So he took his trusty Champ Truck, departed Payson. We met outside St. George Utah and headed up US Hwy 15 on the eastern side of the state through Nevada, Utah, Idaho, Oregon and into Washington. Our trip was uneventful. We left on Saturday August 25th and arrived Tuesday August 28th. Both Ken and I had turn signal problems. His turned out to be a switch which worked from time to time and mine was more complex. I customized the car with 55 Fender spears and functional turn signals including a third brake light and a 4 way flasher. This required a relay which unfortunately blew out. I had a larger unit sent to me at the former motel we reserved for our Washington visit. However, we ended up having to go to a pet friendly motel because Ken brought Rosie, his adopted Chihuahua, who was new to him and a road trip, but she did great! Ken thought he had a problem with a rear end noise so I followed him to a shop in town where they took out the rear end for inspection. Meanwhile, the mechanic who set up my signals sent me the wiring diagram and 2 new heavy duty relays. With Ken’s skill and expertise we re-wired the turn signals – that was a task!! 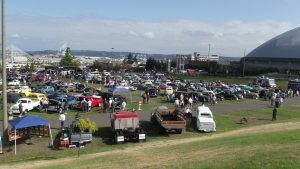 We met up with the Halgrens, St. Claires and the Keatings and hung out visiting the Tacoma Glass Museum and the Le May auto Museum plus the surrounding sites. Ken, the St Claires and Keatings took some of the tours. The weather was really great. Ken Michael, Bob, Ken St. Claire and I took a side trip on Friday near Seattle to one of Bob’s Hupmobile friends. We toured his collection of antique hubcaps and 3 buildings – old chicken coops full of cars he stores for people plus his own Hupmobiles. Bob bought a transmission from him and we headed back to Tacoma. The Halgrens et. al went to the SDC Banquet and I attended the Avanti Banquet. At the Avanti dinner were the daughters of Studebaker President Sherwood Egbert. Tacoma and the northwest does have its traffic so the only free travel we had was up the 15 through Oregon, Idaho and Utah with 80 MPH speed limits. Both cars performed extremely well. The meet was not all that well attended. Maybe some 150 cars – all very nice with some real interesting retromods. Ken and I stayed for the entirety of the Saturday meet and we left about 1 PM. We had an uneventful ride down to Albany, Oregon where we were to part ways Ken heading east and me south. I made it down to Drain, Oregon – about 45 miles north of Roseburg, where our former president and good friend Denny Napier lives. I had the unfortunate mishap of hearing a terrible bang in the engine. No smoke, no loss of oil pressure. I pulled off and got a tow to Roseberg, Oregon (folks are really nice, many people stopped and ask if I needed anything – glad I had those flashers). I called Ken Michael the following day who was now 150 miles away from me and he was kind enough to come back and pull off the valve covers where the problem was discovered. I had a broken Crane Aluminum exhaust rocker arm on the #2 cylinder. The push rod was not bent. This was the labor day weekend. I called JEGS and had a part shipped from Ohio. Of course, I had to wait from Saturday to Wednesday, so I hung out with Denny and we worked in his shop to fix some of his cars. Turns out I have a friend in Roseburg who is another “Car Guy.” He had lots of engine work done by a family shop that does nothing but engines and is now second generation opening the doors in 1949. The son owns the business now and he was just great putting the rocker arm back in and getting me on my way about 1pm Wednesday. Unfortunately, there were fires 50 miles North of Redding so I had to drive 125 miles east, south and west through Mount Shasta (behind 8 trucks at 15 MPH). I rolled into Sacramento about 10 pm and stayed overnight leaving in the morning about 6:00 am. I made it to Los Angeles in 5 ½ hours through the central valley. I visited my daughter-in-law and our grand daughter and then headed for home. About 1 mile from the turnoff at La Jolla Village drive, traffic came to a dead stop. A guy who was following me and taking pictures of “Conchita” – as I call her – pulls up and tells me he “loves the car.” I mention its for sale and he hands me his business card on the freeway. His name – CHUCK STUIDEBAKER – and he lives in Vista. He has too many toys and this was not going to be one of them. So Conchita is still for sale. With ethanol free fuel I was getting over 18MPG. I was able to drive the car up to 10 hours straight with no fatigue. Between 80 and 90 MPH the car ran at 180 degrees. All in all, it was a fun trip and I am grateful to Ken and Denny for helping me. Some pictures of the trip and the event are included.